Samenvatting Psychologie; Peter Gray - Gezondheidswetenschappen VU This summary contains all chapters (except Chapter 5) of the book Psychology of Peter Gray (7th edition). The summary is in Dutch. 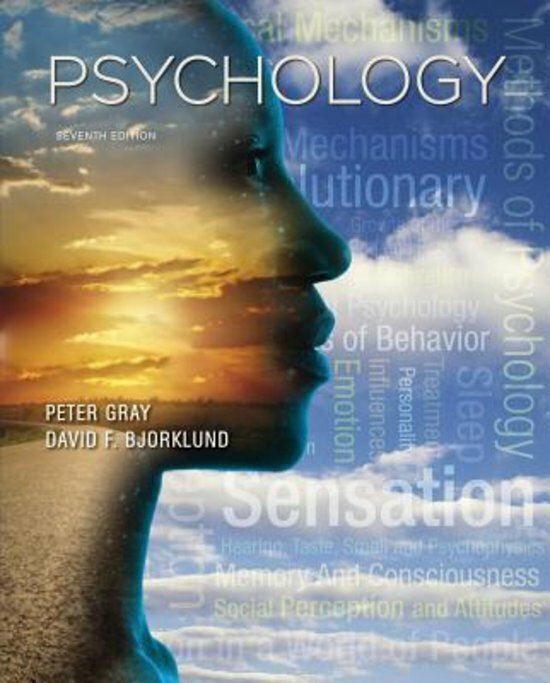 Samenvatting Psychology, Gray, 7th edition, Hoofdstuk 1 tot en met 4 Summary of Chapter 1 and 4 of the book Psychology of Peter Gray, 7th edition. This summary is written in English and examination material for the first partial key for the first year at the University of Amsterdam. Samenvatting Psychology, Gray, 7th edition, Hoofdstuk 1 & 2 Summary of chapters 1 and 2 of the book Psychology of Peter Gray, 7th edition. This summary is written in English and examination material for the first partial key for the first year at the University of Amsterdam. Mind Map - Chapter 9 Memory and Attention_Peter Gray 7th edition Complete mind map (.png) of Chapter 9 book Psychology of Peter Gray 7th edition. Simple English gescreven. Sorry visualization is not possible. On this page you find summaries, notes, study guides and many more for the study book Psychology, written by Peter O. Gray & David F. Bjorklund. The summaries are written by students themselves, which gives you the best possible insight into what is important to study about this book. Subjects like & peter gray & psychology & inleiding in de psychologie & inleiding en cognitie & Psychology & psychologie & gray psychology & 0 will be dealt with.